The JANUS supercomputer has enabled researchers to reproduce the experimental protocol of equilibrium dynamics in spin glasses. The success of the simulation connects theoretical and experimental physical developments using this new generation of computers. One common characteristic of certain systems such as polymers, supercooled liquids, colloids or spin glasses is that they take a long time to reach equilibrium. They are determined by very slow dynamics at low temperatures. The dynamic is so slow that thermal equilibrium is never attained in macroscopic samples. This type of dynamic is characterised by a correlation or coherence length that indicates that particles situated at a shorter distance are highly correlated. Theoretical physicists can calculate this microscopic correlation length by simulating a large number of particles and following their individual behaviour in a supercomputer. These kinds of studies cannot be carried out experimentally because it is impossible to track all the particles of a system, but it is possible to calculate a macroscopic correlation length by applying external fields on the system that modify the energy barriers between the different states. Thanks to the JANUS II supercomputer, researchers from Spain and Italy have refined the calculation of the microscopic correlation length and have reproduced the experimental protocol, enabling them to calculate the macroscopic length. The success of the simulation confirmed that both microscopic and experimental (macroscopic) length are equal. "This study provides a theoretical basis for studies in these physical systems, and the results obtained allow us to directly connect theoretical developments to the experimental ones. We took spin glasses as a reference, because they are cleaner to study as a reference system," explains Juan Jesús Ruiz Lorenzo, a theoretical physicist at the UEx and one of the authors of this study which has been published in the magazine Physical Review Letters. The JANUS II computer is a new generation of supercomputer located in the Institute of Biocomputation and Physics of Complex Systems. "Thanks to this 'dedicated' computer, we are able to simulate one second of the experiment, within the range of the experimental times," says Juan Jesús Ruíz Lorenzo. 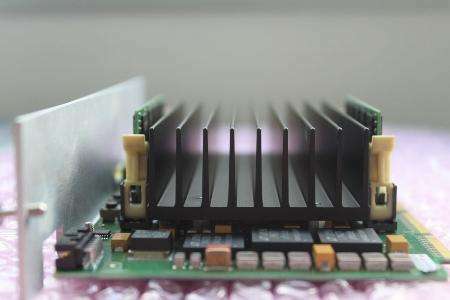 JANUS II is a dedicated supercomputer based on reconfigurable FPGA processors.